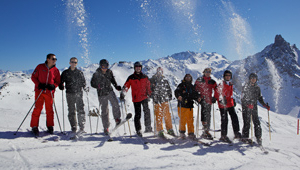 France is the classic destination for a corporate ski event. Whether you’re looking for the exceptional skiing of Chamonix, the world class restaurants in Mégève or the impressively chic centre of Courchevel, France really does have it all. Over half of our clients choose France for their corporate ski events, whether it’s for client entertaining, a company conference or a teambuilding event. Read more about France’s ski resorts below or contact us and let Mountain Leap suggest a resort best suited to your event. Chamonix is one of the premier ski resorts in the world, famous for its world class, high altitude skiing, breathtaking scenery and of course the jewel in its crown, Mont Blanc. Widely regarded as the birthplace of mountaineering, Chamonix is steeped in alpine history. Ever since the discovery of the spectacular Mer de Glace (sea of ice), mountaineers and outdoor enthusiasts have flocked to the magical ‘Chamouni Valley’ , home to the first ever Winter Olympics in 1924. 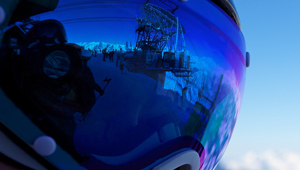 With five unique and varied ski areas and 157km of downhill skiing, Chamonix offers something for all levels of skier with the majestic backdrop of the Mont Blanc Massif. More experienced skiers shouldn’t miss the Vallee Blanche, a 20km run through some of the most spectacular glacial scenery in the world. Add that to a short transfer time, one of the largest ski areas in Europe, legendary apres ski and a wide choice of accommodation and restaurants and it’s easy to see why Chamonix is the stuff of legends. Courchevel is the glamorous face of the Three Valleys, where celebrities flock to ski and be photographed both on and off the piste. Aside from the obvious hobnobbing with the rich and famous, Courchevel also offers incredible, world class skiing for all levels of skier, some wonderful tree-lined runs, great restaurants as well as a state-of-the-art lift system and access to the entire Three Valleys ski network. There are five main resort villages, including the slightly separate La Tania, of which Courchevel 1850 is the ‘Big Daddy’ both in terms of altitude and star quality. It is also by far the most expensive of the villages. The resort architecture lacks a little charm however the wooded runs running through the resort villages more than make up for it. 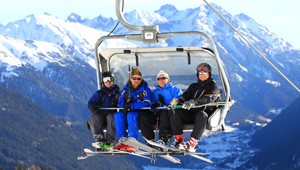 The skiing here is the most varied in the Three Valleys and offers something for all levels of skier. Situated in the Haute Tarentaise, La Plagne boasts an extensive and varied ski area and is linked by the Vanoise Express cablecar to the neighbouring resort of Les Arcs. Together they make up the Paradiski ski area. With Mont Blanc looming big on the horizon, the scenery makes an attractive and varied backdrop to the maze of pistes and many villages which make up the ski resort of La Plagne. The high-altitude villages are mostly ski-in ski-out and varied in character. A largely purpose built resort, the first unit to be built, in the 1960s, was Plagne-Centre. More recent developments are more stylish, and some of the surrounding villages are chalet style and charming. With a variety of shops, cafe’s, restaurants and lively apres ski bars there is plenty to keep visitors amused both on and off the piste. An effortlessly chic picture-postcard resort, Megeve is steeped in charm and tradition with cobbled streets, horse drawn sleighs and picturesque old buildings.There are three distinct ski areas offering over 300km of marked trails and extensive terrain for skiers of all levels. Mont D’Arbois offers some of the best snow, pretty tree-lined runs and wide, gentle slopes whereas Mont Joly offers steeper gradients and a red run renowned for its spectacular scenery as it runs along the Epaule towards St Nicholas-de-Veroce. The resort also offers an exceptional variety of activities for non-skiers and has a designated lift pass so that they can join the group for lunch in the high mountain restaurants.The pedestrianised centre of Megeve boasts a network of narrow winding streets containing a multitude of upmarket shops, bars and restaurants, including 8 Michelin star restaurants. This pretty French resort has a certain alpine charm that’s hard to beat! Sitting in the Dramse River Valley, Morzine is at the heart of the Portes du Soleil ski area, the world’s largest linked ski network. A traditional alpine town perched on the banks of the River Dramse, its picturesque historic buildings, beautiful town squares and beguiling character give Morzine a charm found in few other ski resorts. The Portes du Soleil offers 650km of pistes with everything from gentle valley runs to the challenging Swiss Wall and numerous other technique and stamina testing runs in the high Alps. Take the Portes du Soleil Tour and spend the whole day skiing without seeing the same run twice. After a great day’s skiing, the numerous bars, restaurants, clubs and spas that line Morzine’s bustling centre offer something for everyone and plenty of nights to remember! Tignes. Host to the X Games and famous the world over for it’s high altitude skiing, is part of the Espace Killy ski area and offers fabulous skiing for all levels and abilities. Due to the height of the ski area Tignes is one of the most snow sure resorts in the world. The resort offers plenty of opportunities for fun both on and off piste.For those looking for an adrnalin rush off the pistes there are plenty of exciting non-skiing activities to be enjoyed including ice karting and snow bikes. In addition to the fabulous skiing, Tignes boasts a lively après ski and nightlife. The bars and restaurants offer plenty for all tastes and in particular the ‘Loop Bar’ in Tignes Le Lac has a lovely sun terrace, live music and is very popular with locals, seasonaires and tourists alike. The popular and cosmopolitan resort of Val d’Isère is part of the vast Espace Killy ski area and boasts an excellent snow record. Rated in the top five winter sport holiday destinations in Europe and in the top ten of the world, the resort itself offers a contrasting mix of old and new architecture which meanders along the valley floor from La Daille to the centre. The central town of Val d’Isère sits at 1,850m and is large and bustling, with countless bars, restaurants and clubs. Val d’Isere is renowned for it’s lively apres ski and in particular the parties at Folie Douce. With lifts reaching 3,550m, three glaciers and around 10,000 hectares of skiable terrain along with 300km of marked piste, the vast size and height of the resort brings holidaymakers and extreme skiers from all over the world from November to May. It is thought by many that you could ski here for a month and still find new adventures each day. Val Thorens is compact, purpose-built and is Europe’s highest village sitting at a staggering 2,230m. Set in a huge ski bowl, with pistes running in all directions, the resort boasts excellent snow conditions throughout the season. The ski area is vast as a part of the famous Three Valleys ski area. Visitors can Ski down the valley to Les Menuires and the wonderful La Masse area and then pop over to nearby Courchevel and Meribel on the enormous 3 Valleys circuit. This is truly some of the best skiing in the world. Although lacking some charm as a purpose built resort, the village has been cleverly planned, with a village feel surrounding compact centre and offering doorstep skiing wherever you stay.The apres ski is lively and varied, with the popular bars, clubs and restaurants located close to the centre of the resort. Our clients had a terrific time, which of course was the goal of the trip. We couldn't have done it without Mountain Leap's help.